I finished the waste-gate dump tube and oil return line and all three O2 sensors are hooked up. Looks nice! 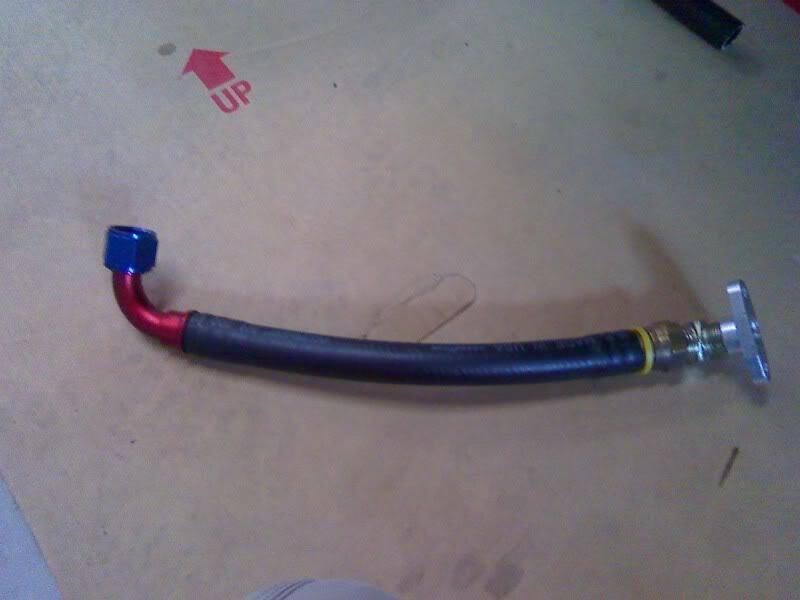 Is the oil return line close enough to the header to need heat wrap? It looks close in the pic. Nice taper on the collector, too. That is going to smell nice when it catches fire. EDIT: wanted to chime in to tell you, your exhaust is ridiculous. Why did you choose to do it that way? Clearance doesn't look to be much of a factor if you had dumped it under the car... How will your wideband read accurately. What sensor is going right there closest to the turbine? It's going to melt/fail regularly. 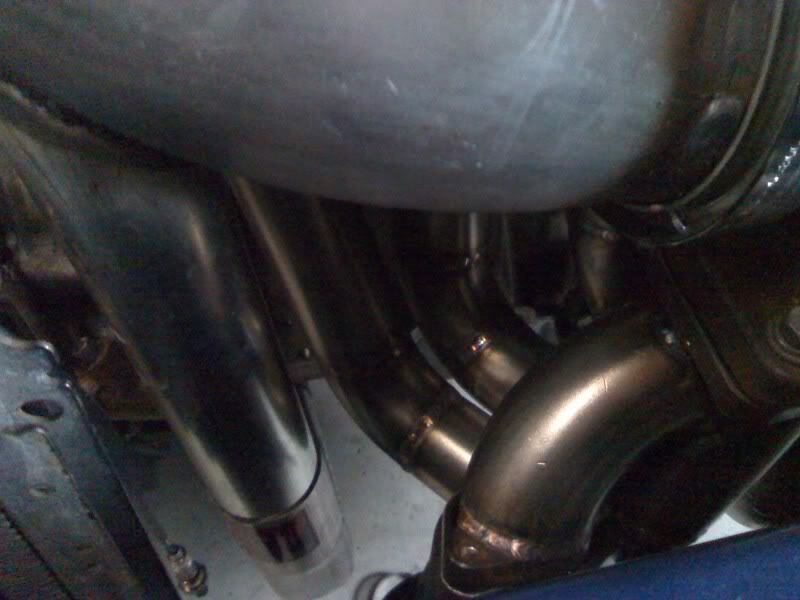 The pic makes it look like its really close but its actually about 2" away from the header tube. It won't catch fire this is not my first turbo build. Your edit response.... I built it this way because the turbo has a 4" outlet. It doesn't dump under the car. It hooks to the stock exhaust. The pics above shows the 2" down pipe not hooked up yet. All the pipes are bent and ready to go, I just ran out of time. Pic showing how its all tucked away with no longer a low ground clearance issue. The 4" up pipe is for when i take it to the track. I will then run the 4" up pipe open. When I run it on the street it will be closed with the 4" v-band cap I built. The 4" down pipe would be a pain to make but it could be done. But then you have the problem with ground clearance. My car is 2" lower then stock and the first driveway with any amount of angle would of taken it out. The O2 sensor will be fine also. I've run one closer then this on my DSM and have never had any issues with failure or miss reading(over 50k miles). Both this car and my other have two wide band O2 sensors and they read the same. One O2 sensor as close as this one and the other about 20" away from the turbine. I also do have a Innovate O2 HBX-1 heat sink. Your next hate post will be why did you go with a turbo that has a 4" outlet. I will answer it before you waste your time posting. This turbo will give me the means to run a 10 second 1/4 mile and make over 450whp. It will also handle the anti-lag that it will be subjected to. Plus it has a very good spool response and will give me the light load that I need to get over 75mpg. Nice build! I would also like to know how you got 74 mpg. What size tires were you running, and what aero upgrades do you have? It seems counterintuitive to have large ring gaps with a turbo, but I'm a N/A guy. I have extreme doubts that during a WOT track pull, while your manifold is glowing red, that the oil return line will survive. More power to ya if it does. 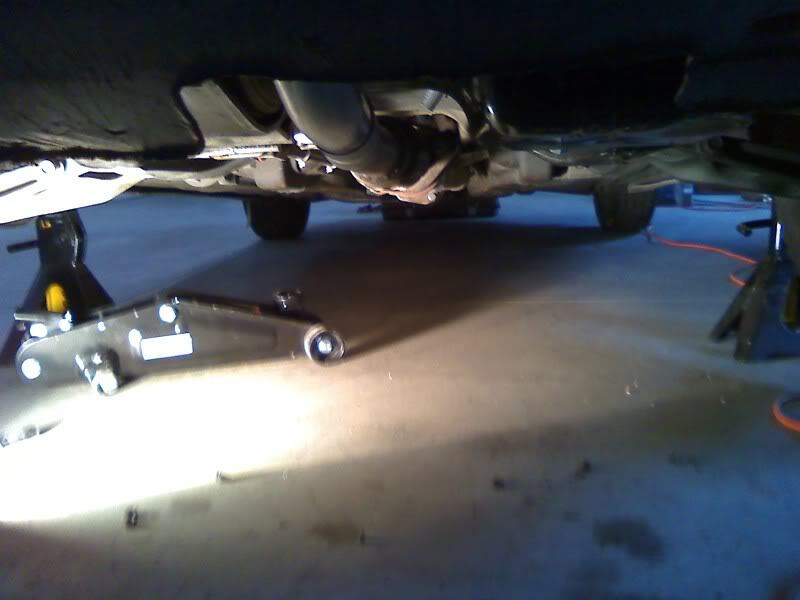 I didn't know that 2" pipe was going to be exhaust routed under the car, I thought it was just some weird dump. Still, about the 2", why did you angle it opposite to what looks like would've been more free flowing? 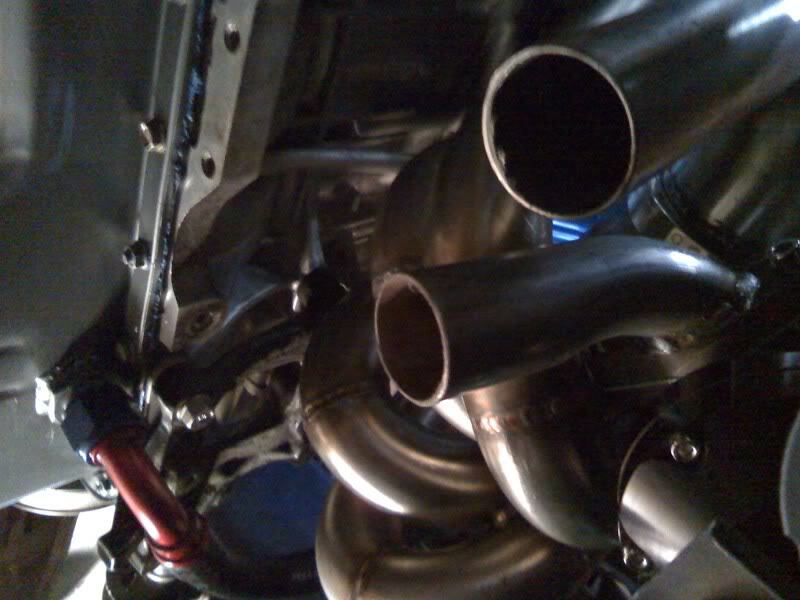 I've seen many y-pipes redone and cars make more power on a dyno just by smoothing out the merge. Your merge is backwards to what is conventional. Is there a reason? Why didn't you just go twin scroll instead? The main reason for the great fuel mileage is a prechamber I built so I can run as lean as 30:1 A/F. My tires are LeMans SR P195/60R14. Aero up grades is the car is lowered 2" from stock. With a grill block. My ring gaps have to be this loose due to the fact when its raced the extreme combustion temperature can cause the ring ends to but against each other if the gaps are to tight. 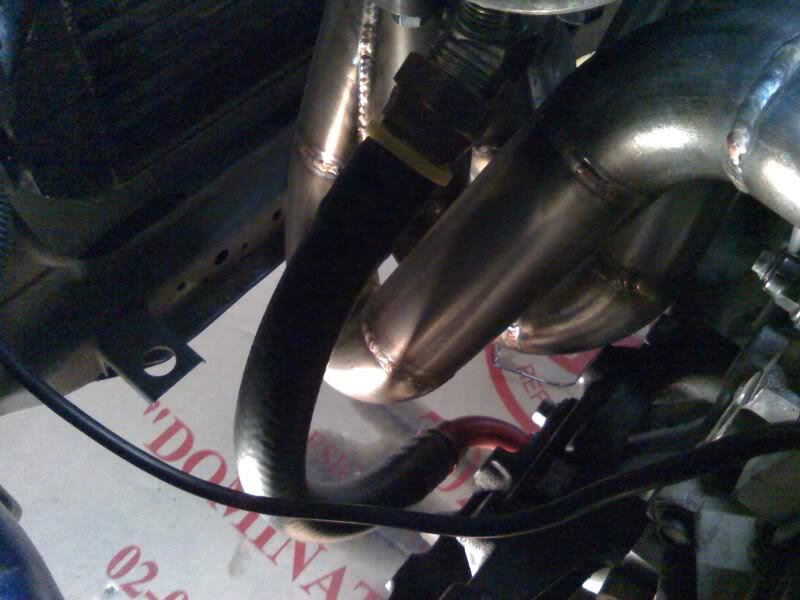 The 2" down pipe is routed this way because of radiator hoses both top and bottom are in the way and the fan etc. Also I'm not to concern about loss of HP with the odd configuration. It only has to make 50HP when its ran in a street mode(4" up pipe capped). The reason I didn't go with a twin scroll turbo is one price, I have three HE 351CW turbos and all of them where given to me for free and also this turbo has been proven to make the power to run mid 10's @ over a 135mph with this engine. Also this car looks and sounds completely stock when I'm running through the stock exhaust system with the uncut hood. But I agree with the oil return line. Why not at least do it in braided stainless? It would not cost more than probably another $20 or so in that short a length and have a lot better chance surviving if it happened to get a bit closer to the manifold.